Mill Creek Veterans Day Parade. Photo courtesy of City of Mill Creek. By Joni Kirk, Mill Creek Director of Communications and Marketing. This will be the City’s largest Veterans Day celebration yet. Our veterans have demonstrated selfless giving through service to our country, and this is one way we can give back to them. The celebration starts with Veterans Walk displays through the city from November 3rd to 12th. Local businesses in Mill Creek Town Center will display mannequins dressed in vintage military uniforms from different military conflicts. The Veterans Walk allows businesses to demonstrate their support for veterans and provides a historical education about veterans for the community. The main activities take place on Saturday, November 10th. The day kicks off at 9:00 am with a commemorative ceremony at Veterans Monument in Mill Creek’s Library Park, 15429 Bothell-Everett Hwy. The ceremony will include opening remarks from Mayor Pam Pruitt, a letter from Senator Patty Murray, a prayer by Mill Creek Police Chaplain Nick Lewis, South Snohomish County Police Color Guard presenting the colors, and Mill Creek Police Veterans raising the Colors. A wreath will be placed on the monument while a bugler from Bugles Across America plays Taps. The Mill Creek Chorale will sing the National Anthem and America the Beautiful. A “Soldier’s Cross,” featuring soldier’s boots, a rifle, and helmet, will be displayed at the ceremony. The Edmonds VFW will provide poppies to participants for a small donation. Following the ceremony, the public is invited to discover military memorabilia and vehicles, which are placed along Main Street. The displays are provided from the Northwest Veterans Museum and other aviation museums at Paine Field. 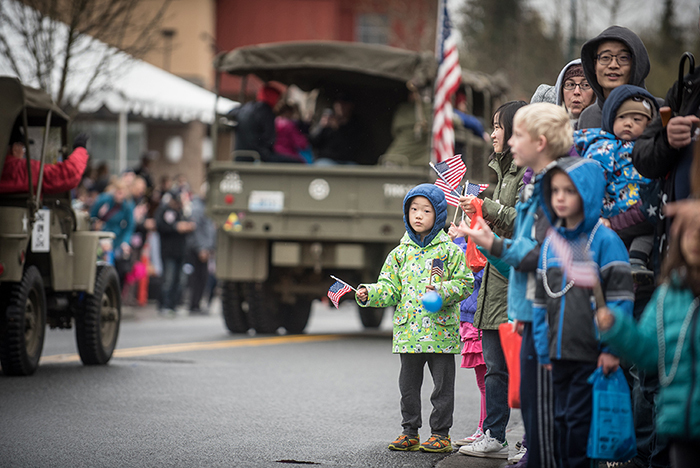 The parade begins at 11:00 am and meanders through Mill Creek Town Center from LA Fitness to Mill Creek City Hall (15024 Main St. to 15720 Main St.). The reviewing stand is at the corner of 153rd Street SE and Main Street. Our Grand Marshal is Command Sgt. Maj. Walter A. Tagalicud from Joint Base Lewis-McChord. He's the senior enlisted ranking person on the base and we’re honored that he is making the trip to Mill Creek to help us honor veterans. The biggest such parade north of Seattle, the show is expected to last one hour. The parade is a jubilant, patriotic event with military and high school bands, color guards, vintage military vehicles, horses, community groups, veterans and tons of family fun. Among the entrants this year are the First Corps Army Band from Joint Base Lewis-McChord, a FV433 British Abbot Tank, a 1918 Tin Lizzie, several honor guards, Seattle Police Department Mounted Patrol, community groups, and much more. A full listing of parade entrants is online at www.millcreektourism.com/veteransday. After the parade is over, the many classic cars and antique military vehicles will move to the Mill Creek City Hall North parking lot for a mini-car show, so parade attendees will be able to get a closer look at the vehicles and take photographs. Main Street between 148th Street SE and City Hall North will close for parking between 10:00 am and noon. The northbound turn lanes on Bothell-Everett Highway will be blocked off at 151st Street SE, 153rd Street SE and 156th Street SE at about 10:30 am; southbound traffic can still make right-hand turns onto those streets. 153rd Street SE will be blocked to through-traffic at about 10:45 am and will reopen after the parade goes by. From Mill Creek Boulevard, traffic can turn north on Main Street, but will be diverted to an access road south of Run 26. Finally, the north LA Fitness parking lot will close at 6:00 am for parade staging; patrons can park in the south lot, but are advised that once the parade starts, access in and out will be temporarily stopped.